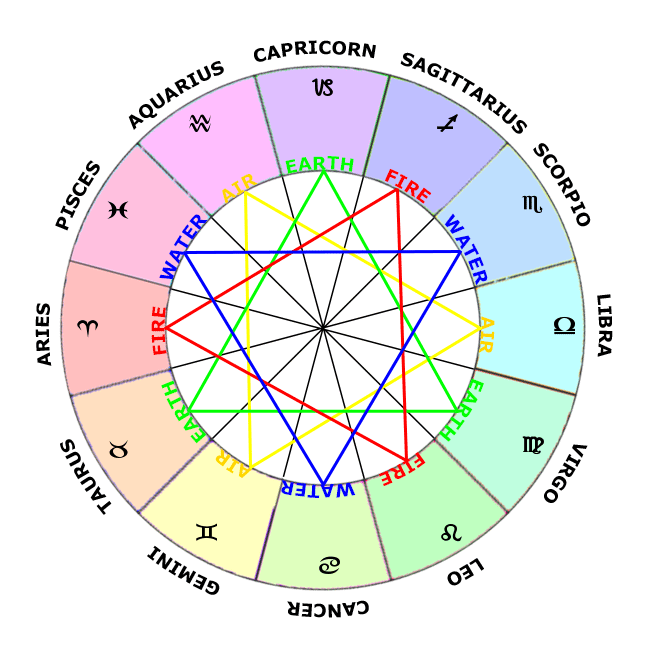 The "four elements" of astrological tradition refer to the vital forces (or energies) that make up the entire creation that is commonly perceived by human beings. The four elements in a birth chart reveal the ability to participate in certain realms of being and to tune in to specific fields of life experience. These elements have nothing to do with the elements of chemistry and in fact transcend them completely. The astrological birth chart is drawn for the moment of first breath, that instant when we immediately establish our lifelong attunement with cosmic energy sources. The birth chart therefore reveals your energy pattern or cosmic attunement to the four elements. In other words, the chart symbolizes the pattern of the various vibratory manifestations that comprise the individual's expression in this plane of creation. "Fire Signs" express the warming, radiating, energizing life principle which can manifest as enthusiasm, faith, encouragement, and the drive to express self. "Earth Signs" reveal an attunement with the world of physical forms and a practical ability to utilize and improve the material world. "Air Signs" are correlated with the mind's sensation, perception, and expression, especially related to personal interaction and to geometrical thought forms and abstract ideas. "Water Signs" symbolize the cooling, healing principle of sensitivity, feeling response, and empathy with others. "Cardinal Signs" correlate with the principle of action and symbolize initiating movements of energy in a definite direction. "Fixed Signs" represent concentrated energy gathered inward toward a center or radiating outward from a center. "Mutable Signs" are correlated with flexibility and constant change and may be conceived as spiralic patterns of energy.